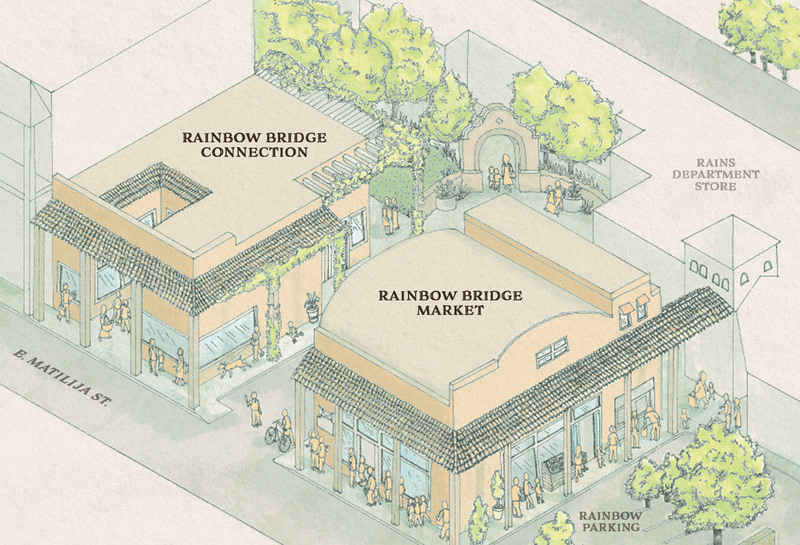 The Rainbow Bridge Marketplace was created as a response to the Ojai community’s desire for health-oriented, locally grown and handpicked options for families and pets. In this next exciting phase, we are spreading into multiple roofs to create a village gathering place for Ojai’s locals, guests, and other visitors. Rainbow Bridge represents the fusing of the health-based natural food industry, with produce and products grown locally, organically and sustainably, and then supplied to the people and guests of Ojai. The marketplace offers carefully selected groceries, organic produce, organic pet food and supplies, and healthful deli items and catering menus that feature prepared foods, including vegan, non-vegetarian, gluten-free and dairy-free choices. Our in-home catering and delicious comfort foods will satisfy almost all your food needs. We are also thrilled about our own state-of-the-art water-processing plant. The Rainbow Bridge Village Marketplace and Community Gathering Place is offering a unique Ojai shopping, meeting and eating experience with a commitment to high-quality standards, helpful and personalized service, and fair prices.